Montpellier has an abundance of green spaces, parks and gardens. Visitors looking for somewhere pleasant to walk need look no further than the Jardin des Plantes, the Esplanade, or indeed one of the many other small parks in Montpellier. The banks of the River Lez, with their picturesque pedestrian bridges, are also good places for the whole family to take a stroll. There are also plenty of opportunities to sit back and relax. Many parks and gardens in Montpellier feature quiet picnic spots, as well as play areas to keep the children thoroughly entertained. This 16th-century creation has today become a place of tranquility amidst the daily hustle and bustle of modern Montpellier life. Look out for the garden's follies and grottoes, as well as canals, rock gardens and a pond. Keen botanists will enjoy the collection of plant specimens at Le Jardin des Plantes, including its tropical greenhouses, orangery and bamboo garden. 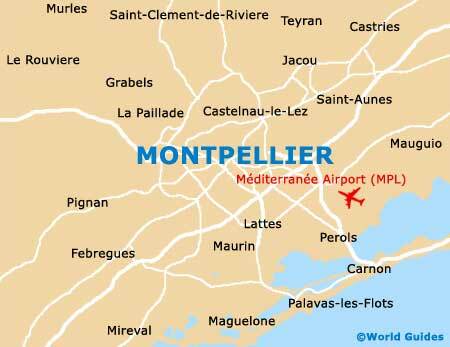 There's plenty of space to roam in this vast wooded area of Montpellier. There are lots of paths to follow at Bois de Montmaur if you're a keen walker, and a number of picnic areas and children's playgrounds. As well as plenty of green space, this 90-acre / 36-hectare park located within the estate of a château, comprises botanical greenhouses, horse-riding centre, sports facilities, bird park, and theatre and concert area. Located a little way out of the centre of Montpellier, in the Figuerolles district, this popular park acts as a centre for the local community. The Parc de la Guirlande features all of the attractions that you would expect of a large park, including tree-lined paths, a pond, fountains and children's play area. This vast park is home to over 100 difference species of animals, both indigenous and from more exotic habitats. Visitors to the Parc Zoologique du Lunaret may be rewarded by a glimpse of zebras, antelopes and even a cheetah amongst the trees. Visitors can follow some 9 km / 6 miles of paths to explore the site. There are also picnic sites. Montpellier's Esplanade extends from the Place de la Comédie to the Corum. 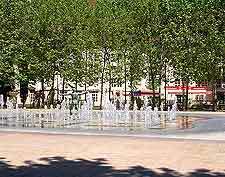 Visitors can stroll in the shade of its plane trees, admire its pools and fountains, as well as enjoy the various games areas and seats dotted along the way. Next to the esplanade is the Champs de Mars, an area which was formerly used by the military and which was converted into a public garden in 1900. Le Jardin des Potiers is an archaeological garden and is set against a backdrop of the remains of two medieval buildings, the St. Esprit Church and the Pila St. Gely Gate. Both were discovered during excavation work for the new tram system. The site was more recently used as a pottery workshop.